Previously we mentioned about CaptureWizPro that can capture animation movement on desktop, but if you don’t want to have hassle of downloading and installing before it can be used, now there is a similar web based service that can help you to achieve the same purpose at no charge. 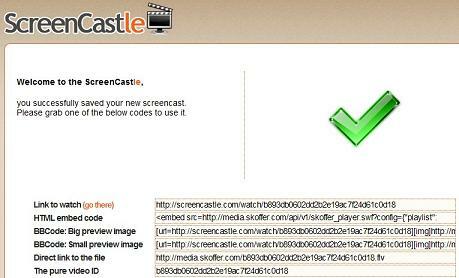 The website, with the name of ScreenCastle allows users to record screencast directly from your browser and share to others in simple steps. No complicated setup involved, users just need to browse to ScreenCastle website and they can start using it immediately without the need to sign up or login a new account. Clicking on the red icon followed by “Start Recording” button press will start the recording session. There is an option that lets users define what kind of resolution (for example: 1024 X 768) they would like to record to make the whole sharing session more meaningful. Once recorded, users can preview it before deciding to save it for further processing. Good thing is, users can select to view it directly or embed into blogs by getting the various links generated from the website. This is especially useful when you need to demonstrate or share certain steps such as a short tutorial on how to configure system setup or install driver that will definitely make the sharing more effectively. Only one pre-requisite, users will need to install Java in order for the recording session to launch successfully.